The more multifamily unit houses that are built, the more important acoustic testing,insulation ratings, Sound Ratings becomes. It is also one of the most controversial and confusing topics a homeowner, strata council, architect or designer will ever encounter. This write-up helps to break down well-known brand available to the average homeowner and what the company has done to achieve such high ratings. STC 72 and IIC 73 are common numbers but how does this company make a 3.2mm piece of air filled plastic offer up such amazing sound properties? The answer is simple: they don’t because they can’t. The company spent a tremendous amount of money and materials (someone else’s materials in this case) to increase the value of the product on the shelf. 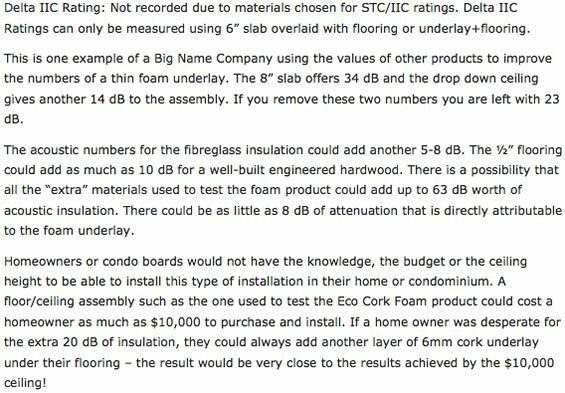 The bottom line is – that which is most important to homeowners and condo boards – most buildings (80%-90%) do not and cannot incorporate the type of materials needed to reproduce such astounding numbers. This leaves the tenants in the building upset that they have “…done everything we were told to,” yet their neighbors still complain about the noise! We’ve our ½”. 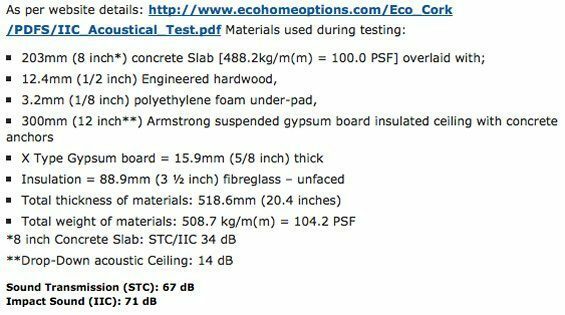 ¼” and 1/8” cork underlayment offers a reduction of 48 dB, 23dB, 13dB, and 10mm and ½” floating cork flooring offer a reduction of 16dB and 19dB. Our ½” cork floating floor/½”. ¼” and 1/8” underlay combination offer a reduction of 67 dB, 43 dB and 22 dB.